Every year, many of the individual storytelling events that take place around the globe are linked by a common theme. 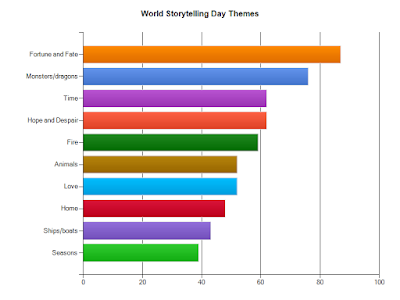 The selection of the theme is a global event in itself: themes are suggested by storytellers from around the world through the worldstorytellingday listserv and the World Storytelling Day Facebook page. This year, Dutch storyteller Melanie Plag and Canadian storyteller Dale Jarvis collected the various suggestions into a list, and an online poll was created and shared. Close to 400 storytellers and story lovers from far and wide voted for their top two favourite themes, to set the topics for both 2013 and 2014. The votes have been cast, the numbers have been crunched, and the themes have been selected! Good work, Dale and Melanie! I never do seem to vote for a winner in any election -- political or otherwise. ;-( So, F&F and then Monsters/Dragons and then maybe ships/boats.... I'll start getting my campaign team together now. ;-) And now on to announcing this to groups in Illinois USA and hoping to get some events planned!